New Delhi: CRPF commands the love and respect of the countrymen. Through its selfless service and indomitable courage the Force has endeared itself to the people across the length and breadth of the country. This was stated by Sh Rajnath Singh, Union Home Minister while addressing the Force personnel at Gurugram on the occasion of its 79th anniversary. Describing CRPF as an embodiment of bravery, grit and determination, the Home Minister said that there is no bullet yet that can tear through the valour of the CRPF soldiers. He cited many recent events including the ones at Sumbal, Karannagar, and Lethpora in Jammu and Kashmir, wherein the bravehearts have proved their mettle in decimating the terrorists and their nefarious design. Asserting that there has been a visible reduction of the Maoist activities in the country, Sh. Singh said that the left wing extremism is now in its last leg. Describing this improved situation as nothing less than a miracle, the Home Minister was all praise for CRPF’s role in making it happen. He further said that CRPF is not only organising civic action programmes, but also taking active part in social movements like swachhata abhiyan, Beti bachao Beti Padhao Abhiyan. He called upon the Force personnel to sensitise people about all that the government has been doing for their well being.On the occasion the HM presented medals and citations to the kins of martyrs and other personnel of the force for their commendable performance. 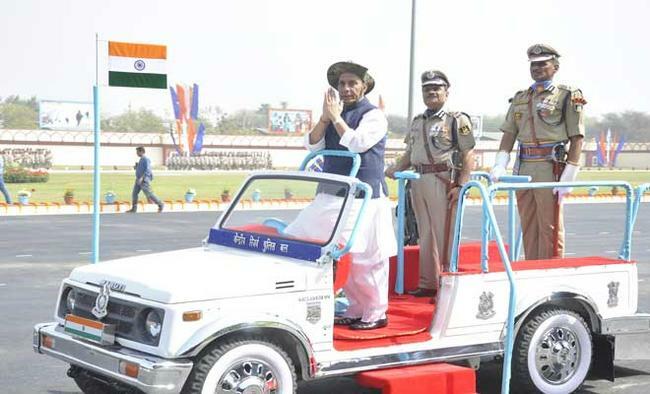 Earlier the home minister inspected the CRPF contingents and took the salute. Speaking on the occasion, Sh R R Bhatnagar, DG CRPF touched upon various valiant deeds performed by the force personnel since it began it's journey from 1939. He said that due to the active involvement of the force in J&K, LWE areas and the North East, as many as 172 terrorists and 35 Maoists have been neutralised during the last one year alone. He said while in J&K, more than 1800 dreaded terrorists have been arrested, 110 terrorists have surrendered. Similarly, while 1670 naxalites have been put behind the bars, more than 100 naxalites have surrendered. He assured that CRPF will always rise to the challenges of internal security and come off with flying colours. On this solemn occasion, Sh. Bhatnagar also paid rich tribute to all the 2121 bravehearts of the force who have laid down their lives for the sake of the motherland.The magnificent anniversary came to a close with splendid show of acrobatics and the impressive daredevilry of the canine squad.